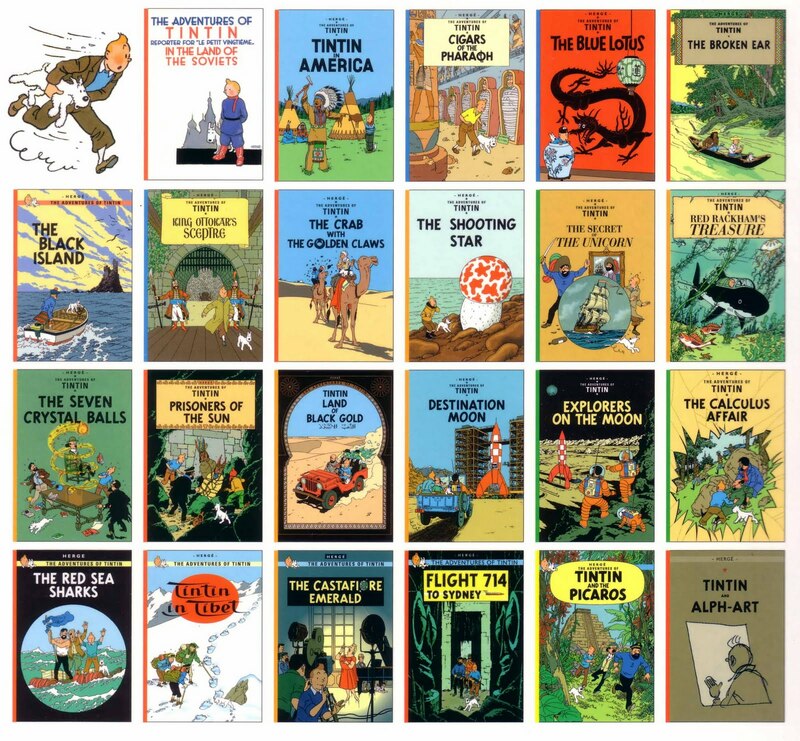 Here are my rankings of the Tintin books. This is nothing more than a "favorite Tintin books" list. Each Tintin book is listed under a one to five star category with five stars being the best. And no in-between stars like 3.5 stars or 4.25 stars either. Just straight one, two, three, four, or five stars. No zero stars. And under each of the categories I listed the Tintin book in order of publication date. Not in order of preference. For example, all the Tintin books under three stars are roughly equivalent to one another. I don't really have a strong preference within each category, although I could list ones I personally liked for this or that reason more than others. But in the end I liked all the stories under each category of stars more or less the same, even if for different reasons. Obviously a favorites list is bound to be subjective to a large degree. One can't always objectively define why one person favors this particular story over another story any more than one can always objectively define why blue, not red, is a person's favorite color. It's mainly about how much I liked the story, which in turn is dependent upon a number of personal factors like how I grew up, my sense of humor, what kind of people, places, events, or other things in a story I find "fun" or "enjoyable" (which in turn again invite more subjective elements and judgments). True, there is a sense of objectivity in, say, what makes for a well-crafted story. But just because a story is technically well-crafted doesn't necessarily mean it's enjoyable for everyone. For example, I can respect how technically sophisticated and well-crafted a movie like Citizen Kane is, but it doesn't mean I'd like it nearly as much as something silly but fun like The Princess Bride or Star Wars or Batman. However sometimes there is the happy confluence of the objective as well as subjective such as in the movie Dark City. Similarly one needs to be well-versed in a particular subject in order to know how to break its rules and transcend the subject. For example, T.S. Eliot was a masterful poet. A very modern poet too. And an autobiographical poet in the sense that his art, if not imitates, mirrors his life, moving from the hopeless moral nihilism we read in The Waste Land to the God-soaked The Four Quartets when he became an Anglican churchman. Yet Eliot knew how past poets penned their poems, he knew about the different elements which have historically made for fine poetry (e.g. prosody, rhyming schemes, forms), he was learned in poetic history from the epic Homeric poems to the most recent avant-garde poems written in his day, etc., and so he knew how to break with tradition in order to create novel poetry. In the same way I can appreciate how learned Hergé was in European comics (very different from our American tradition of comics), how to draw comics, and so forth, and therefore I can appreciate some of his experimental attempts to do something new within the comic medium. But it doesn't mean I necessarily enjoy everything he's done. Some of it is amazing (e.g. ligne claire), while others not so much. Again my "favorite Tintin stories" list depends in large part on many subjective and personal elements. What's more, many of these elements are intangible. Many of these elements are, in fact, inexpressible and tacit. One can't always explain in a logical, rigorous, analytical way why one likes something and not something else. Even an astute and intelligent as well as knowledgeable person with a high verbal facility can't always communicate why he or she likes something. Let alone someone like me who is far, far less astute, intelligent, knowledgeable, fluent, and so forth. Sometimes we just like what we like and that's all we can say. I provide a very brief plot summary without spoilers after each title too. I'll probably come back to this bit whenever I can find more time. I'd like to share detailed thoughts on each story if I can. If you want more info about Tintin and his creator Hergé, check out this article from Fred Sanders and this interview with Michael Farr. Other articles which shed light on Tintin and Hergé are from The Economist as well as The Wall Street Journal. If you want other favorite Tintin lists, I noticed Thomas Wikman and Colin Ricketts have written their own. The Blue Lotus (1936). Tintin in 1930s China. Quite political, quite progressive for the period of time. Hergé was helped with the facts of the story as well as other matters such as drawing the Chinese characters by his real life Chinese friend whom Hergé wanted to give co-author credit but his friend turned it down. An early story which quite honestly I didn't think I'd enjoy since I don't personally find this period of Chinese history particularly interesting, but having read it I think it's the best Tintin story. Seven Crystal Balls/Prisoners of the Sun (1948/1949). Tintin in South America among a sort of neo-Incan secret society. By turns amusing, thrilling, and spooky. Loads of fun. Right up there with Blue Lotus, but more of a fun and adventurous story than a political one like Blue Lotus. Destination Moon/Explorers on the Moon (1953/1954). Tintin goes to the moon. The first story (Destination Moon) is very talky and not my cup of tea. Lots of dialogue. But the second story (Explorers on the Moon) really picks up. Lots of adventure. Some of Hergé's most beautiful art too, at least in my view. By the way, prior to reading this story, I thought it would be my favorite of all the Tintin stories because I love space and astronomy and the like. It's still up there, but not as high as I expected it to be. Calculus Affair (1956). Tintin by way of an Alfred Hitchcock or classic spy or espionage thriller. Tintin in Tibet (1960). 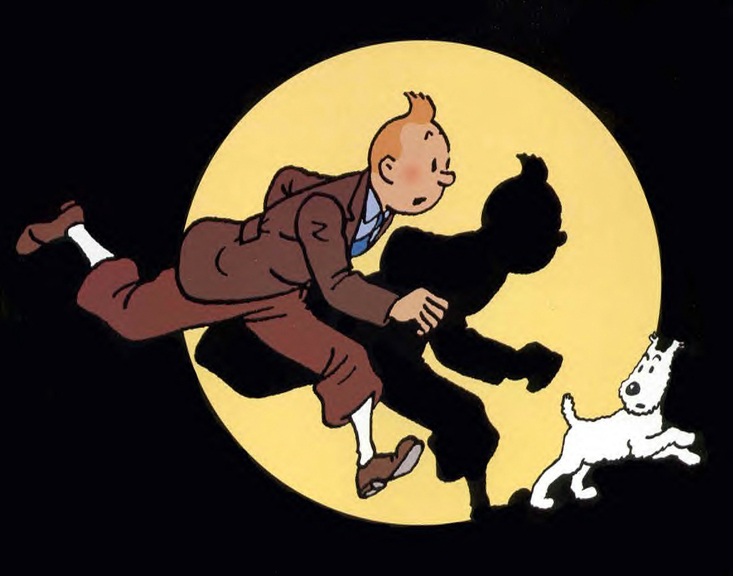 Tintin searches for his best friend, Chang. No real enemies to combat. A simple, moving story. Flight 714 (1968). Tintin meets Lost (TV) meets early Spielberg. Some people love this story, others hate it. I'm of course in the former camp. But I happen to like Lost in its first season and some of Spielberg's early work so that probably explains a lot of the reason why. The Broken Ear (1937). Tintin in Central America, trying to keep one banana republic in tact. The Black Island (1938). Tintin in Scotland and facing a dangerous beast. King Ottokar's Sceptre (1939). Tintin saves a monarch from the dictator Musstler by finding his sceptre. The Crab with the Golden Claws (1941). Tintin tries to foil opium smugglers. The Shooting Star (1942). Tintin on the high seas and in a race to get to a fallen star aka meteorite. The meteorite is a silly idea but I liked the race by boat to the Arctic. Secret of the Unicorn/Red Rackham's Treasure (1943/1944). Tintin channeling Robert Louis Stevenson and Jules Verne. Also the basis of the new Spielberg-Jackson Tintin movie (along with The Crab with the Golden Claws where we first meet Captain Haddock). These 1941-1944 Tintin stories are strictly Tintin adventures rather than dealing with politics given that Nazi Germany had taken over Belgium at this point and it was therefore dangerous for Hergé to write too much about politics as he did, for example, in The Blue Lotus. Land of Black Gold (1950). Tintin in the Mideast over oil. Interesting how the Mideast, oil, Islam, and the like were viewed back then. Red Sea Sharks (1958). Tintin spoils slave traders. Castafiore Emerald (1963). Tintin channels P.G. Wodehouse. The plot is pretty thin, nothing much happens. The story takes place entirely on the grounds of Marlinspike, which is Captain Haddock's inherited mansion residence. The story contains a lot of attempted comedy and red herrings. A lot of people love this story. I thought it was a good experiment, but not Hergé's best work. Cigars of the Pharaoh (1934). Tintin in Egypt. But reads more like a series of set-pieces where Tintin tries to escape from one small adventure to another. Some narrow escapes were more fun than others. There is an overall story but I didn't find it very interesting. The best part of this story is that it leads into The Blue Lotus. Tintin and the Picaros (1976). Tintin back in South America with the guerrillas as in The Broken Ear. But Hergé has lost his mojo. The magic is gone. Tintin isn't himself. He's not even wearing his trademark pants or trousers!